CeFaan Kim has more from Prospect Heights. 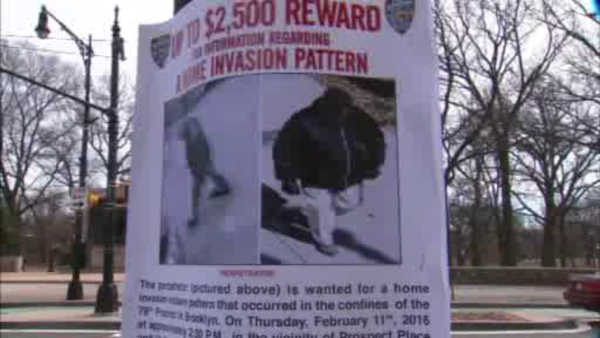 PROSPECT HEIGHTS, Brooklyn (WABC) -- Wanted posters have been popping up all over Prospect Heights for a 250-pound man who seems to prey on elderly women. With the most recent attack, police now believe there is a pattern. "It's really scary - this is really scary," says resident Carmen Lalonde. In an earlier attack this month, the suspect followed a 91-year-old woman in neighboring Park Slope. Police say he followed the woman, and pushed his way into her home before choking her at gunpoint. Now, police believe he has struck again. Last Saturday, police say the suspect approached an 81-year-old at gunpoint with a boxcutter in his hand near Prospect Place and Carlton Avenue. He then demanded money. "It just makes you more vigilant, like when you're coming home late at night. Make sure you watch behind your back, and make sure people aren't coming behind you when you're walking into your house. It is really alarming," adds Lalonde. Investigators say a pattern is emerging, and the suspect is tied to at least four robberies dating back to several months, including a home invasion in Park Slope in February, where he pistol-whipped a 71-year-old woman. "It doesn't really surprise me totally, although it's too bad," says Kelly Patton. However, not everyone in Prospect Heights is shocked, saying a suspect like this knows exactly where to strike. "A very nice neighborhood is sometimes a good neighborhood for people to perpetrate crimes, because you think you're safe, so you think you don't have to take extra steps to watch your surroundings," Patton adds. In each incident the suspect takes off on foot with several hundred dollars in cash. There is a sizable amount of reward money for information that will lead to an arrest - $2,500 from CrimeStoppers. The Brooklyn Borough President is also offering several thousand dollars on top of that.